Starring: Asha Parekh, Rajesh Khanna, Prem Chopra, Bindu. Shakti Samanta’s films in the late 1960’s and the early 1970’s were often about female characters trapped in undesirable circumstances and trying to battle their way out of their own problems. In “Kati Patang”, a series of unfortunate incidents strike Madhavi (Asha Parekh). On the day of her wedding, Madhavi receives an emotional letter from her lover, Kailash telling her how he cannot live without her. But he is a nasty villain actually. And how do we know that? Well, he is played by none other than the sneering Prem Chopra. On the day Madhavi is due to get married, Kailash is busy engaging in a little hanky-panky with Shabnam (“Pyar se mujhe log kehte hain Shabbo, ha ha!”), played by Bindu. Madhavi disobeys her common sense and escapes from the wedding. When she lands at Kailash’s house, she catches him in the act with his girlfriend. Having seen him for who he truly is, a depressed Madhavi goes back and sneaks back into her home. By this time, it is too late… The wedding has been cancelled, the guests have gone home and the rejected groom and his family have left in a huff. But Madhavi’s trauma does not end there. She discovers that her father has died of a heart attack. All alone (she has no other family), Madhavi prepares to leave town. At the rail station, she meets a dear old friend, Poonam. Poonam, too, has not had an easy time of it lately. Once a happily-married woman, she is now a grieving widow and her only khushi is her baby son, Shekhar. Poonam is now on her way to meet her in-laws who have invited her over. They have never met because Poonam and her husband had married against everybody’s wishes. Recognising that Madhavi has no real place to go, Poonam invites her to go along with her. Poonam’s plan is that Madhavi can pretend to be her sister and this way they can stay together (her in-laws obviously don’t know very much about their bahu then!). Madhavi reluctantly says yes to this idea and goes along with Poonam on the train. No, the film does not end there. One thing noticeable about “Kati Patang” is the absence of Sharmila Tagore. While she has done a few typical heroine roles in Shakti Samanta’s films (“Kashmir Ki Kali”, “An Evening In Paris” etc), her most serious roles have been in “Aradhana” and “Amar Prem”. “Amar Prem” released after “Kati Patang” but all the female roles in these three films fit the same mould. The mould is of a woman who has become an outcast in society for upsetting the moral codes through a simple mistake on her part. She then lives her life as a condemned woman and every bit of kindness or love becomes precious to her because it is something that is rare in her life. Surprisingly, Asha Parekh performs in this film quite well and shows restraint in the emotional scenes (though the occasional overacting can be forgiven). She was a huge star but she was a weak actress and that shows through the way that she hammed in a lot of her films. 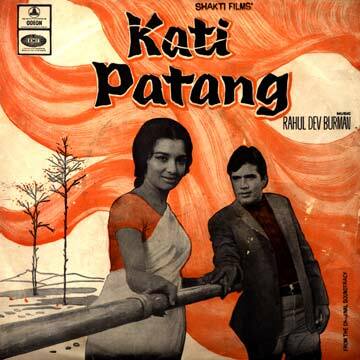 “Kati Patang” actually has the best performance by Asha Parekh in her entire career. Samanta has the ability to make his actors to give their best and Parekh shines. In contrast, in Nasir Hussain’s “Caravan” (released the following year), Parekh’s portrayal of a similar character is wooden and artificial and Aruna Irani steals the limelight in a supporting role. But then Nasir Hussain rarely ever concentrated on trying to make actors give their best. One thing I love about this film is the development of the romance between the two lead characters. While some typical scenes are thrown in (for example, Kamal saves Madhavi from a baddie), the progression of their love for each other is understated and heartrending. There is no love at first sigh, it grows over a period of time through the bond of friendship. The conversations that Kamal and Madhavi share are nice to watch and the background sound of Lata Mangeshkar humming adds a haunting but touching quality to the scenes. In the song, “Jis Gali Main Tera Ghar Na Ho Balma”, Kamal and Madhavi’s hands reach out to each other. But just as they are about to hold hands, they remember the boundaries of their friendship and withdraw their hands. The film freezes this moment and gives a frozen close-up of their hands. Maybe it is unsubtle but it works because it is trying to tell us that the two characters value deeply these moments where they grow ever so closer to each other. They freeze these precious moments themselves and hold it in their memories to be cherished in secret. Shakti Samanta’s films often give the message that what society thinks about an individual is not important. Why should an individual’s life be ruled by what a society thinks about them? This message is played out through the character of Kamal. He invites Madhavi to his birthday party. Madhavi hesitates, thinking that a widow has no right to be at a party and also, what will people think? Kamal argues that what people think is not important. What is more important is that he desires for her to come to his birthday party as it would make him happy. A similar message is echoed in “Amar Prem” where Anand Babu (also played by Rajesh Khanna) croons, “Kuch to log kahenge, Logon ka kaam hai kehna”. Rajesh Khanna’s wistful performance complements Asha Parekh’s thoughtful portrayal of her character. It helps that they share nice chemistry and I can’t think of an actor that Parekh has ever had better screen chemistry with (although the same cannot be said for Khanna as I think his best pairing was with Mumtaz). Prem Chopra and Bindu are electric together especially when they are in their evil conniving mode. The rest of the supporting cast are adequate. The album, composed by RD Burman and set to mesmerizing poetry by Anand Bakshi, is an absolute classic. At least five numbers are all-time favorites among music-lovers.